Anyone else glad it’s Friday!? 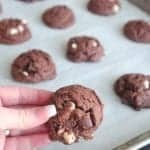 I am up way too early this nice Friday morning, so here I am posting this yummy cookie recipe I made earlier this week while everyone is sleeping. I had a little baggie of these cookies set aside in the kitchen so I could take some pictures and when I went to get started yesterday, there were only 3 lonely cookies left for me to work with! My husband couldn’t keep his hands off of these! I had a very ripe banana that needed used up so I decided to design a cookie for it. I thought, hmmm why not try to use this banana in place of the butter.…. I wasn’t quite sure how they’d turn out and was really happy with the finished product. They are soft and have a fantastic flavor combo of banana, chocolate and peanut butter which is by far some of my favorite flavors! Aside from the Reeses Cups, these cookies aren’t half bad for you either!! Have a great weekend everyone and try a new cookie recipe! 1. Preheat oven to 350 degrees F. Place banana and both sugars into stand or electric mixer on medium speed and mix until well combined. Mix in vanilla, egg and peanut butter until combined on medium speed. 2. Place flour baking powder, baking soda and salt into a bowl. Slowly add to the wet ingredients until JUST combined, then add the Reeses Cups. Don’t over mix this. 3. Scoop cookie dough using a medium cookie scoop, roll into sugar and place onto a parchment or silpat lined baking sheet. Using the palm of your hand, gently press down cookies so they are about ½ inch thick, they don’t spread much. Bake for 7-10 minutes or until cooked but still soft. Let cool for 3 minutes on hot cookie sheet, then transfer to a cooling rack. These look wonderful. My husband would love them. You take wonderful pictures and your recipes always look so good. I made you firehouse chicken and the Grilled Balsamic Bruschetta Chicken in the last couple of weeks and really enjoyed both. Thank you! You are up way too early for a Friday morning too! So glad you enjoyed the firehouse chicken and Bruschetta chicken. 2 of my favorite recipes! Thanks for commenting. These sound really good. I’ll be pulling my pork roast out of the crock pot in a few to make the sweet pork salad for tonight. Can’t wait to try it. Have a great and relaxing weekend! These look great! I love the flavor combo… I wish I had some reese’s cups on hand to make them tonight. Oh well… means I’ll have to buy some soon so I can make these. I’m sure that they will be a hit. ps… I envy your ability to create recipes, that’s something I really wish I could do! Yum, that sweet pork sounds good today. I hope your family enjoys it as much as we do. Let me know what you think! I had to run to the store to buy more Reeses cups to make another batch of these. These don’t last very long! I’ve spent the last 4 years creating recipes, but trust me, I’ve had my fair share of disasters! I think I’ll forever be experimenting in the kitchen! I am so making these this weekend. I just love this site! You are my hero! I am going to try these cookies!!! My bananas on the counter are just about ripe enough. Did you roll the cookie in sugar? Sounds like a great combo. Are they a really cakey cookie like banana bread? I’m glad your husband left you those 3 so we can all see them. Amasing what an “going-bad banana” can do! Those are beauties. I love peanut butter and banana together. I love that you experiment and make-up new recipes. I’m always afraid of the diasasters I might create so I don’t do it. Maybe I’ll get brave after reading that you have had disasters too! These look yummy. I too love banana, chocolate and PB. Wha a great idea to replace the butter with bananas, I would have never thought of that. These sound delicious and look beautiful as well! I was just looking for a new cookie recipe. I will have to give these a try tomorrow! Hope you enjoy these Nikki! Yes I rolled the cookies in sugar. Let me know how the family likes them! These cookies aren’t cake like, pretty much just like a regular cookie. I’m surprised he even left me 3! Yes, the disasters are all part of experimenting! Just beautiful and delicious! I love the ribbon! And plate! My husband wouldn’t have left ANY cookies, so yours is very thoughtful! I’ll have to check out Anthropology and see what they’ve got. I actually used scrapbook paper for most of these pictures, it works out pretty nice. I like all the designs to choose from! Nice looking cookies! I like the sound of adding bananas and peanut butter in a cookie! ok i am a little stressed…i am making your sweet pork salad so i just put the meat in the crockpot and i mixed a cup of coke and ketchup and poured it over the meat! then i read i am not supposed to combine them until tomorrow! what do i do? is this ok? also-do you recommend making the dressing the night before or does it matter? thank you. sorry if this is annoying! i appreciated your response so much last time. Bananas, peanut butter – seems to be the theme this week – throw in chocolate and you’ve got nearly every other blog covered. These look like really flavourful chewy cookies. I bet you can’t just eat one. Hi. I came across your blog linked from one of my friend’s blogs (Kerry Black). Anyways, I’ve been hooked and “lurking” on it ever since. I tried your banana PB cookies yesterday! Since I didn’t have PB cups, I just used semi sweet choc chips. Also very good! I think my only problem was that my bananas were a hair TOO ripe…they had sat around so long that they were completely black and shrunken. OOPS. Ha! So the cookies had a pretty strong banana flavor. I am going to make them again with a “normally” ripe banana. Great recipe! THANKS!!!!! Sorry this is so late, I’m sure you’ve already made the pork by now, but if I would have done that, I would have still cooked it overnight, discarded all the liquid, make the sauce and pour it over the pork. Hope it still was good! I would highly recommend getting the Reeses cups for these, it’s those that really make the cookies! Jenny these look delicious! I’m amazed that you came up with this recipe all around a simple banana! You are amazing as I have told you before, but it’s true! I must try these! I just found some cool new mini-reeses peanut butter cups in the baking isle that I’m excited to try out! Mmm… Those look awesome Jenny! p.s…I knew I recognized that as scrapbook paper..I’ve got it in my stash! What a great idea to photograph your food on it! I’d start with 20 mini ones and then maybe add 5 more if it looks like it needs more. Enjoy!! Yah, the scrapbook paper is an inexpensive way to jazz up pictures! Thank you for this recipe.I’ve just made them Jenny. I’m linking to your recipe if I may.Thank you..
Holy Moly! I tried these, and they are so good. I love the peanut butter/banana combo. Too bad they don’t make more. We ate them way too fast! Thanks for your creative recipes. You’ve got talent! I’m Sara from My Sister’s Cucina. Thanks for visiting our blog. Yummy! I love the Peanut Butter/Banana combo. They are so tasty. Too bad they don’t make very many. They went way too fast. I can’t wait to make them again…I can still taste them! Thanks! Thanks for another winner! I had reese’s pb eggs from easter still! Chopped em up and they were great. Love your creative recipes! i didn’t have the reese’s pb eggs, so i substituted choc chips…i cannot imagine how AMAZING the reese’s version must be…the version i made is seriously TOO good. it’s possible to make something too good? ?……….who knew. Those look so good! I love that they don’t contain additional butter. I’m going to make them when I have an overripe banana. Over two-and-a-half years after this was posted, and I made these for the first time yesterday! What a wonderful recipe! I was a bit skeptical about using the mashed banana instead of butter, but the result was a wonderfully soft, delightful cookie. I rolled them in turbinado sugar before baking, so they had a nice little crunch to the outside. Thanks for sharing! Just made these cookies with leftover Halloween Reese’s and they are scrumptious!!! Very easy and I love that it’s made with banana and whole wheat flour vs the alternative. Would definitely recommend. Thanks for the recipe!